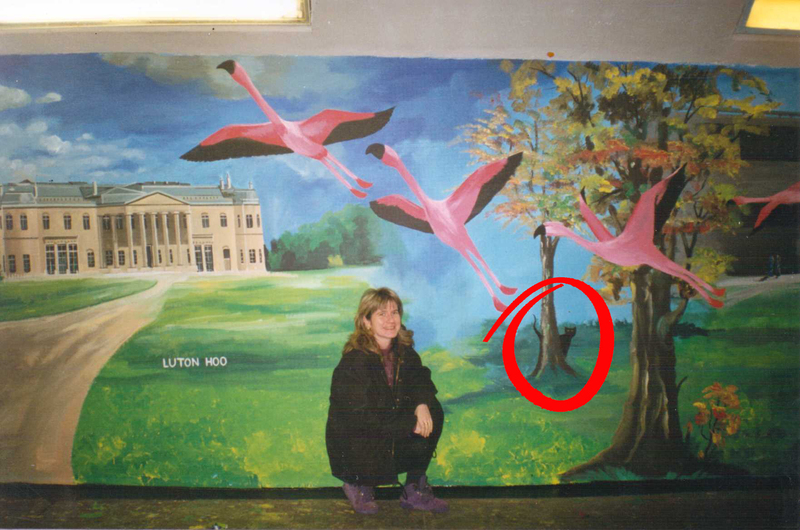 When I first started painting murals, I always tried to include a black cat as my signature symbol, it was quick and easy to do and quite simple to include in to most mural scenes. But fate took over and the cat got chased off by a huge pack of dogs! 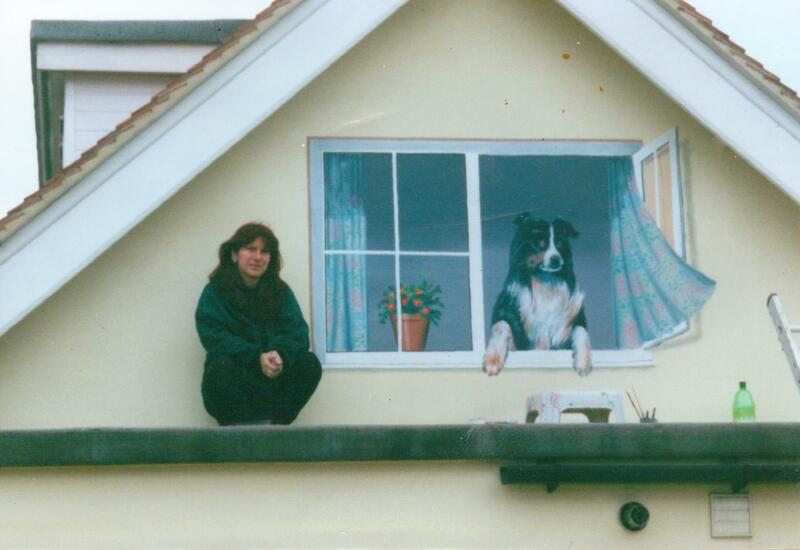 In 2001 I moved to Poole and one of the first murals I was asked to paint was that of a dog looking out of a window in Gilbert Road, Swanage. The owners of this house kindly allowed me to put my website and contact details onto the lower wall of the cottage, and this led to lots of new work opportunities. In Autumn 2003 I started my Fine Art degree at The Arts Institute, Bournemouth and for one of my units I came up with an idea of using dogs in public spaces in response to street art that I was researching at the time, in particular Banksy and his rats. I aimed to do a legal version of this kind of art and wanted to make mine fit in with my ‘trompe l’oeil’ style. It occurred to me that you rarely see stray dogs in the UK these days and if you were to walk along a street and see a lone dog wandering around, it would really catch your attention and the likelihood is that it had been abandoned or lost. This thought then triggered a memory of an organisation I had heard of some years ago, called DogLost and I wondered if I could use actual dogs that were lost or stolen to depict in my murals and maybe this would raise awareness of their absence and help their owners to locate them. Before I started, I produced a sample version to show my idea. 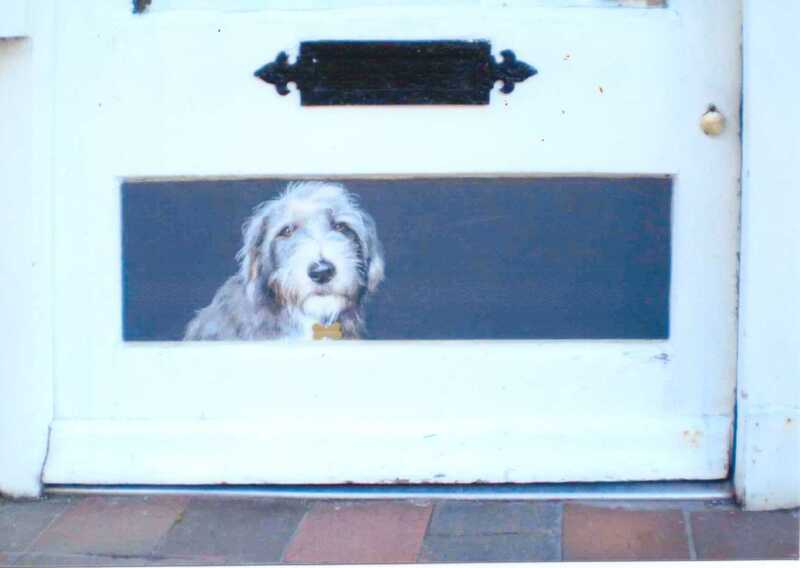 This was on the back door of The Studio Art Shop in the High Street, Poole, and the dog was Chaos, belonging to the owner of the art shop. I then contacted DogLost and told them about my idea and they were extremely keen to help me and sent me a list of dogs that had gone missing in the local area, with contact numbers of their owners. 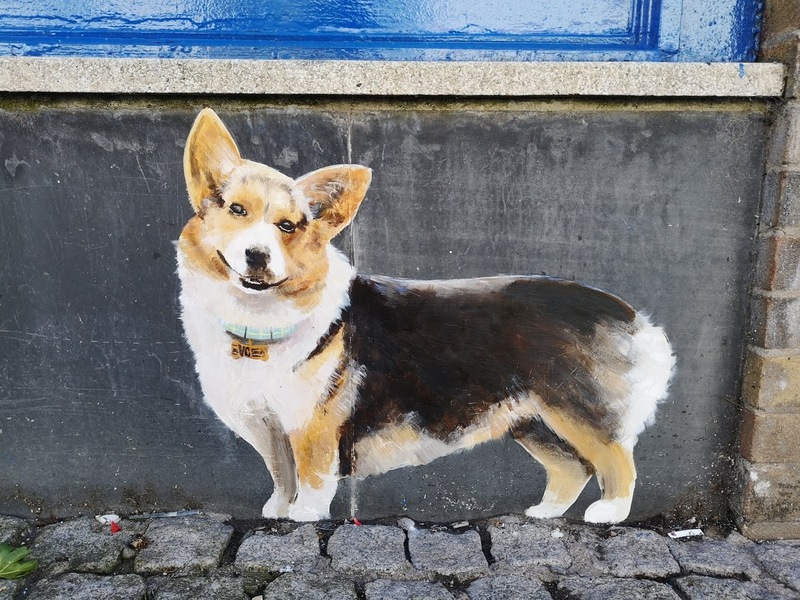 I had my list of dogs, and several owners who were keen to have their missing dogs depicted in mural versions, next I needed public spaces to put them. 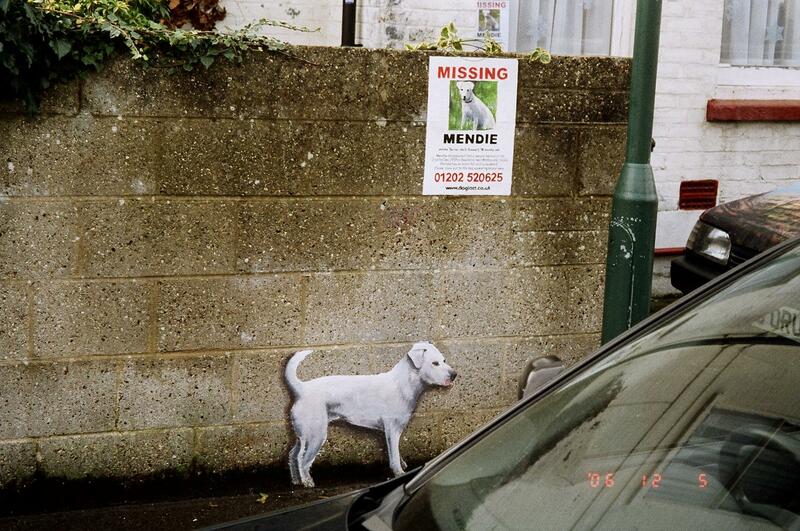 I continued to work with Dog Lost for the following few months and produced several more lost dog murals in various streets around Poole and Bournemouth. Eventually I got to a point in the list of missing dogs where the owners no longer wanted to find their missing dogs, as they had been gone for a year or more and they had replaced the dog with a new one, and no longer had space for the missing dog if it was found. I’d had great feedback on the dog murals and wanted to continue with the theme, so I had to find a new angle. This time I approached a dog rescue organisation called DAWG (Dorset Animal Welfare Group) and explained what I wanted to do and asked if they would be interested in working with me on a new project. I ended up doing an artist’s residency within the dog rescue premises and used the new series of murals to try and raise awareness of the plight of some of the dogs who had ended up in the rescue home. 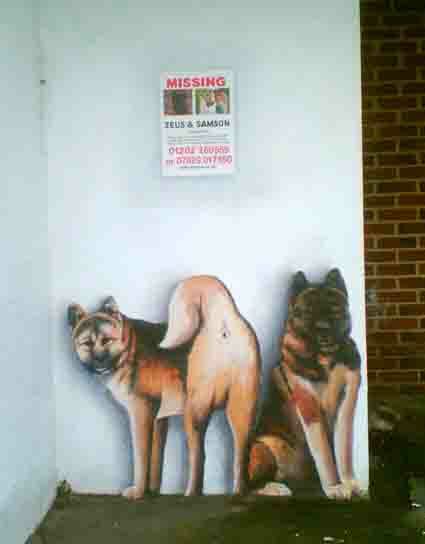 Each mural had a painting of the actual dog and a small write up nearby explaining how the dog had ended up in the rescue home. 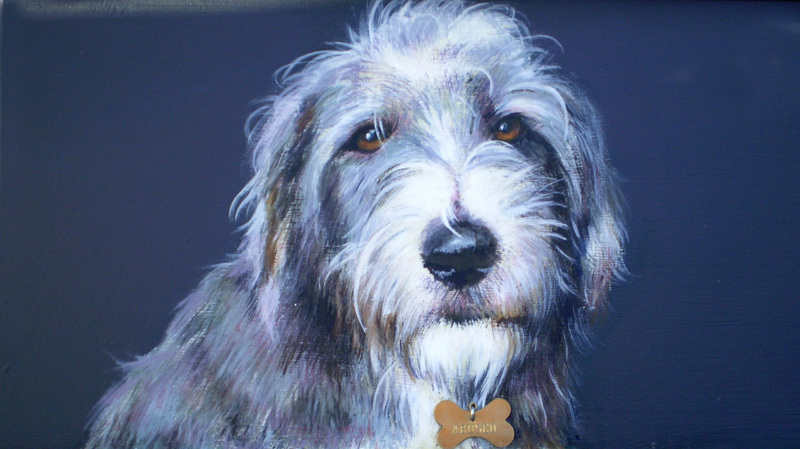 After this project came to an end, I started to get commissioned to do more dog murals by people who had seen them and lost count of how many dog murals I had produced in the Poole and Bournemouth area. Many of these are shown on my website. 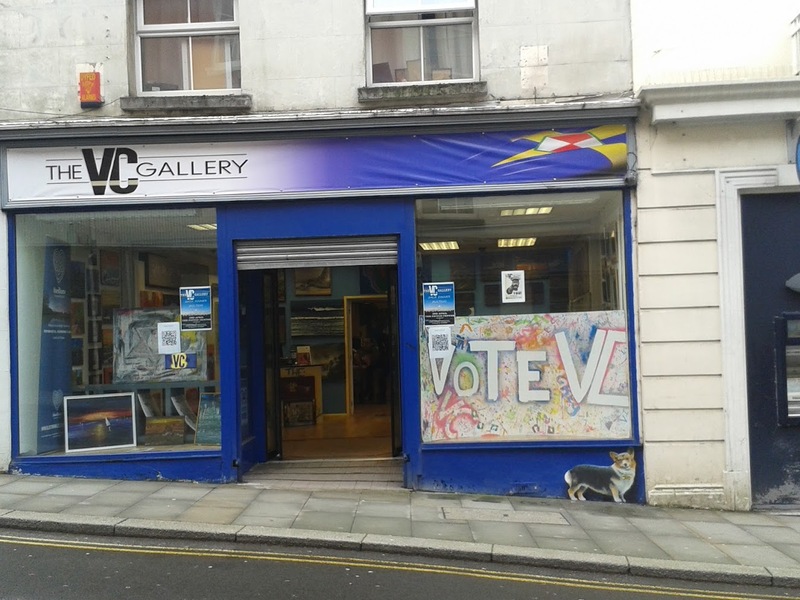 Since moving to Wales, I began by painting a Corgi on the front of the VC Gallery in Haverfordwest, as this was the mascot for the gallery. I painted another one on the new premises when they opened a 2nd branch in Dimond Street, Pembroke Dock. 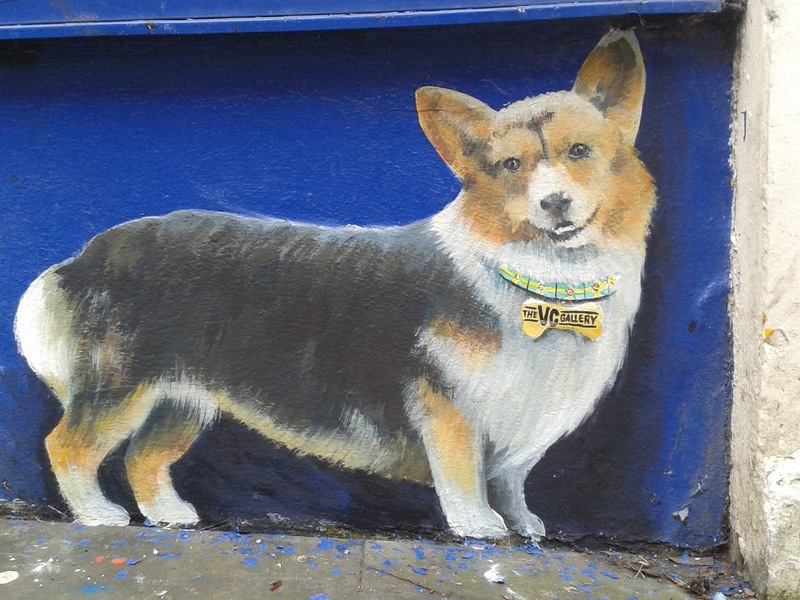 When the neighbouring shop owners saw the Corgi, I was asked if I would be able to paint their dogs onto their shops too, I agreed as I thought it would be a fun way to brighten up the area and raise the profile for the gallery. This became the start of the ‘Dimond Dogs’ project, now starting to spread into some of the other streets, so may have to be renamed ‘Dogs of the Dock’.